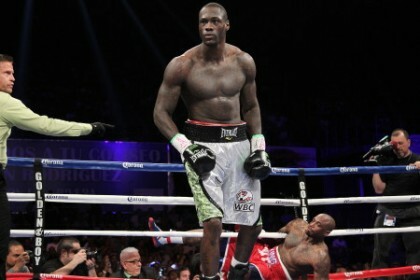 In what was supposed to be his toughest test to date according to most boxing pundits and fight experts, WBC Heavyweight title challenger Deontay Wilder destroyed 13 year fight veteran Malik Scott in just 96 seconds this past Saturday night in Bayamon, Puerto Rico. The “Bronze Bomber” took care of business with a cracking left hook/straight right hand combination that suddenly floored his 33 year old opponent midway through the opening stanza of the scheduled twelve round contest. Although the experienced boxer/puncher attempted to reach his feet before the referee’s final count, Scott failed to show signs of an ability to continue and was counted out by the third man in the ring. But as quickly as the Tuscaloosa, Alabama native finished the job, fight fans and boxing scribes everywhere began to tarnish his dominant KO performance with sentiments of corruption, regurgitating the idea that the proud Philadelphia born pugilist and fringe contender “took a dive”. In the days leading into WBC title eliminator bout, Many ringside observers and boxing writers reported that the two competing Heavyweights were indeed very close friends, and were concerned that the highly anticipated contest might not live up to its competitive and explosive billing. Was the 96 second performance a product of friendship and fraternal favor, or was the KO a genuine example of Wilder’s “Alabama Power”? On Tuesday night’s episode of “The Pugilist KOrner” radio show, the newly appointed WBC title challenger responded to all of the opinionated conspiracy theorists. Although the fact that Scott and Wilder’s friendship has been exploited and used as evidence, proving a fixed outcome in the minds of most conspiracy theorists, the 6’7” Heavyweight contender insists that friendship among combatants is a common occurrence within the relatively small community of prizefighters. Although the explanation from the charismatic Heavyweight fighter seems plausible, Wilder realizes that every conceivable and possible argument won’t be enough to sway or satisfy his detractors or conspiracy theorists.